We begin summer hours with our last Friday Low jinks on May 24th. We switch to Thursdays, and on Sept 6th return to Fridays. The 5th floor remains open, but the 2m pub closes for Fridays over the summer. There is no Low Jinks Thursday, July 4th! Three pieces of Lambs history were recently framed for the Fold. They are all Western Union telegrams that were sent from club members to others. Two are new to the club and contain hundreds and hundreds of signatures of members, some who joined the club in the 19th century. A newer one, from 1972 (yes, Western Union was still in use) was sent by Shepherd Tom Dillon to an ailing member. It was put into a nice new frame. Look for these on the walls of the Fold. Thanks to the Lambs Foundation for preserving these. The widest, and biggest, has an amazing story. 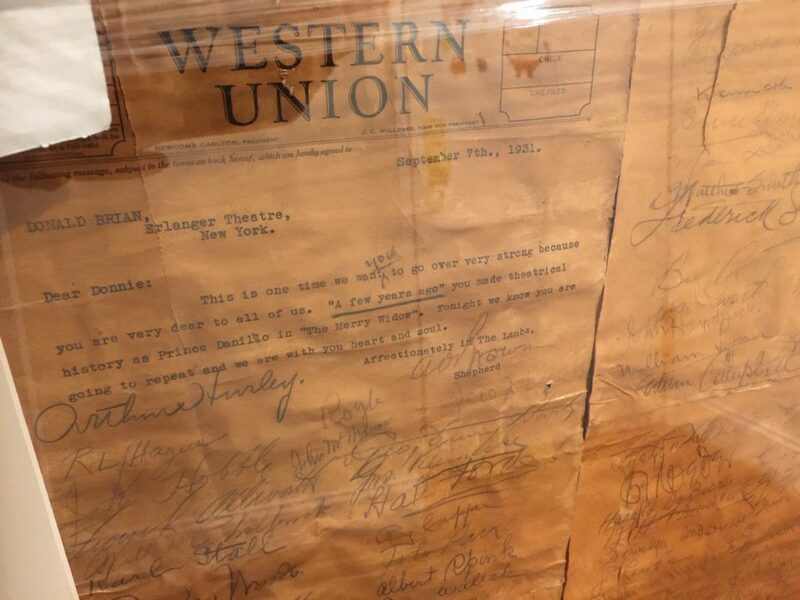 On September 7, 1931, this Western Union telegram was sent to Lambs member Donald Brian on the occasion of opening night of the revival of The Merry Widow. It is signed by more than 200 fellow Lambs and friends. Among those who signed this are Robert Hood Bowers (1877-1941) composer/conductor for silent movies; Albert O. Brown (1872-1945) Shepherd 1921-24, 1930-32, theater manager; R. H. Burnside (1873-1952) Shepherd 1918-21, Immortal Lamb, and writer, director, producer, actor who staged hundreds of shows and ran the Hippodrome; Harold De Becker (1889-1947) Actor; Ernest Glendinning (1884-1936) silent movie & stage actor; John McGraw (1873-1934) member of the Baseball Hall of Fame, won World Series three times; Ray Peck (1874-1950) Shepherd 1945-47, Immortal Lamb, writer, lyricist, composer of musical comedies; Edwin Milton Royle (1862-1942) successful playwright; Percy Wenrich (1887-1952) Immortal Lamb, producer, Tin Pan Alley composer and member of the Songwriters Hall of Fame. More than a dozen names are illegible; if you can decipher these, please inform the Club Historian.